Image size is 5,1 x 4,6 cm. 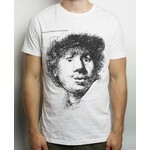 Rembrandt is unparalleled as a maker of self-portraits. All of them are small and show only the head or at most a bust. Sitting in front of the mirror Rembrandt would experiment in recording a variety of facial expressions on the plate. He would use studies like these as exercises for the figures that were to express particular emotions in larger compositions. This is his surprised look. Magnet of Rembrandt: Self-portrait, open-mouthed.